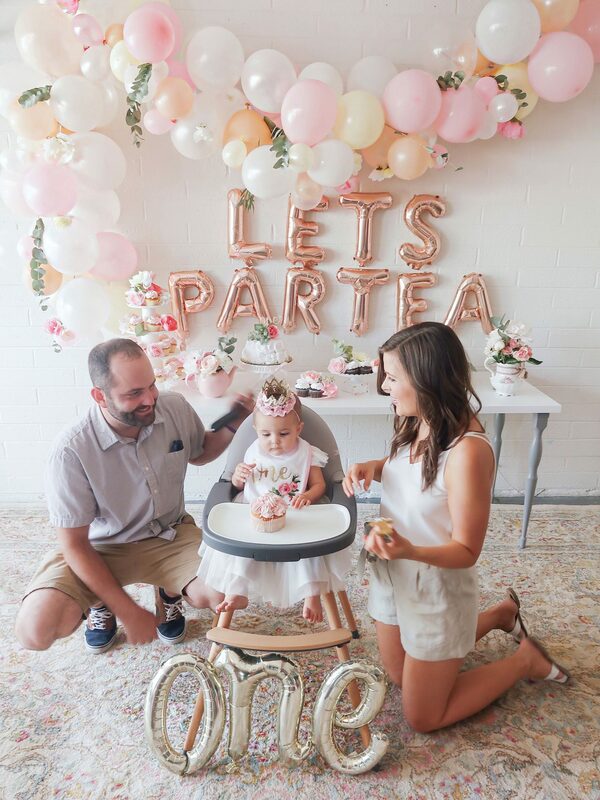 First birthday tea party for our baby girl, Scottie Rose! 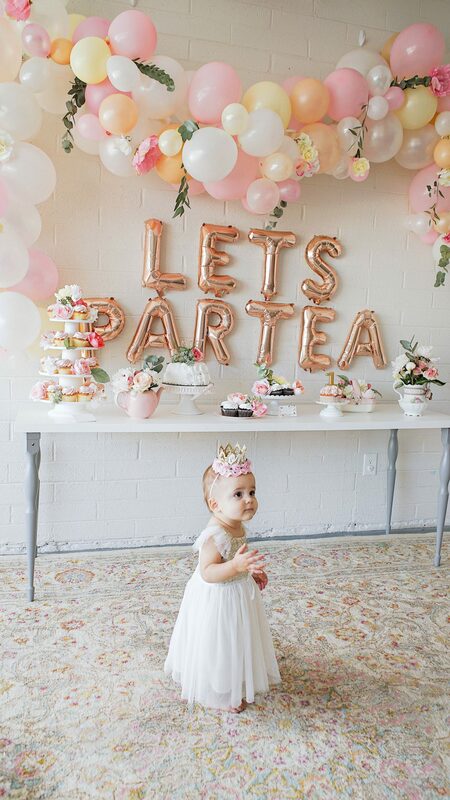 Florals, neutrals and pink party decor with a balloon garland arch and easy DIY ideas. 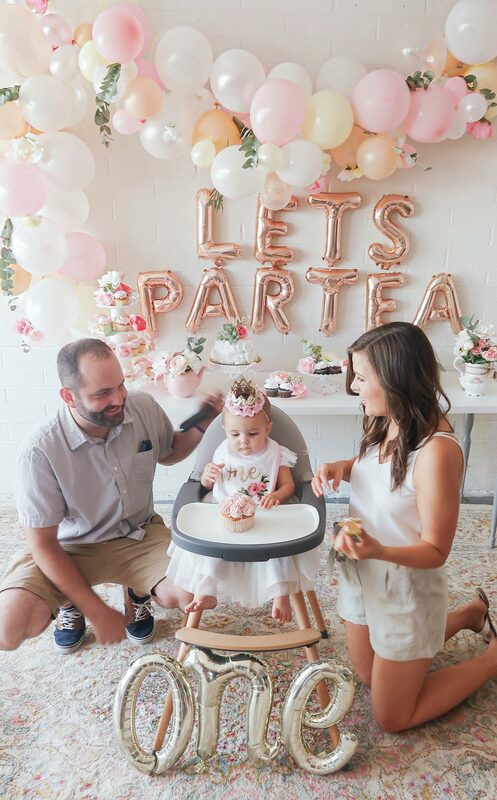 Get ready for photo overload because I’m finally sharing all of the details from Scottie’s first birthday tea party! It was over two months ago, so this post has been LONG overdue! 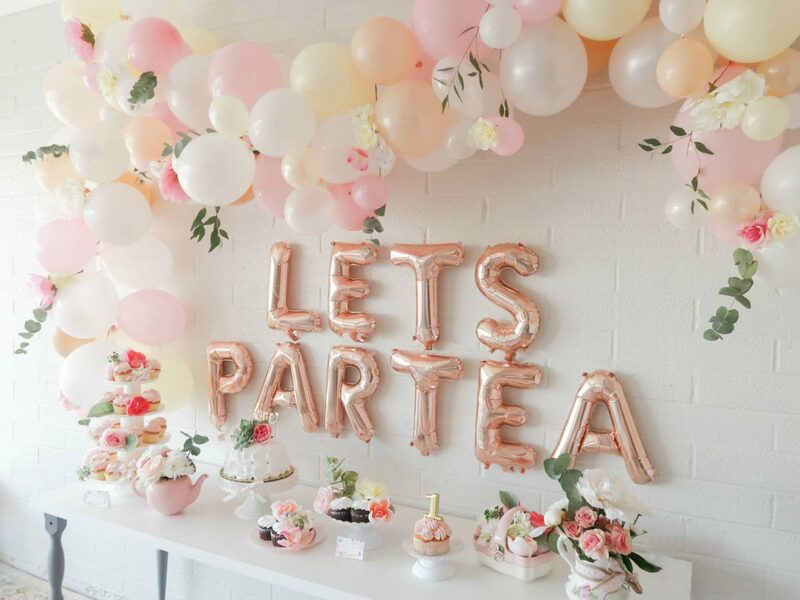 To be honest, I thought about not sharing it because it’s been a while but party planning and decorating is something that makes me truly happy and feel my most creative and I’m really trying to be better about showing other aspects of my life besides fashion…so here we are! Scottie’s actual birthday fell on a Friday (May 18th) this year, so we chose to have her party the next day. I actually set the date and decided on a theme way back in December! You’re probably going to laugh at this, but I actually chose the theme on the day that Prince Harry and Meghan Markle announced their wedding date. Spoiler Alert: They got married on May 19th. Double Spoiler Alert: They are what inspired the theme. 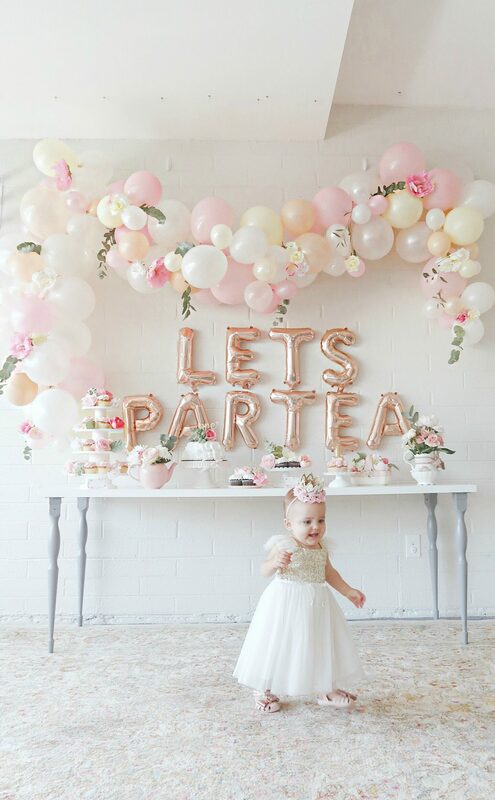 We had a royal tea party first birthday celebration on the day of the royal wedding! 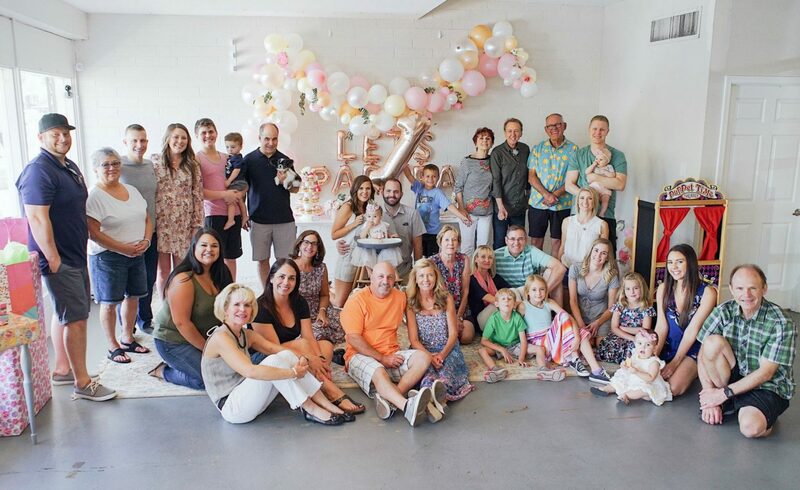 We chose to have Scottie’s first birthday party at a kid-friendly venue, Mini Social, rather than our house because things were pretty hectic at the time. More on that later. 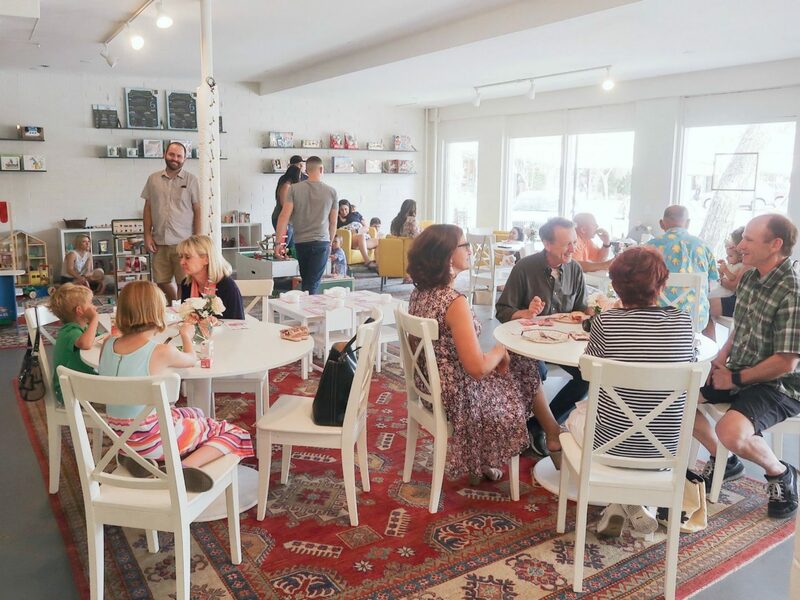 😉 Mini Social was the perfect space to decorate how I wanted because it has big blank white walls and lots of natural lighting. 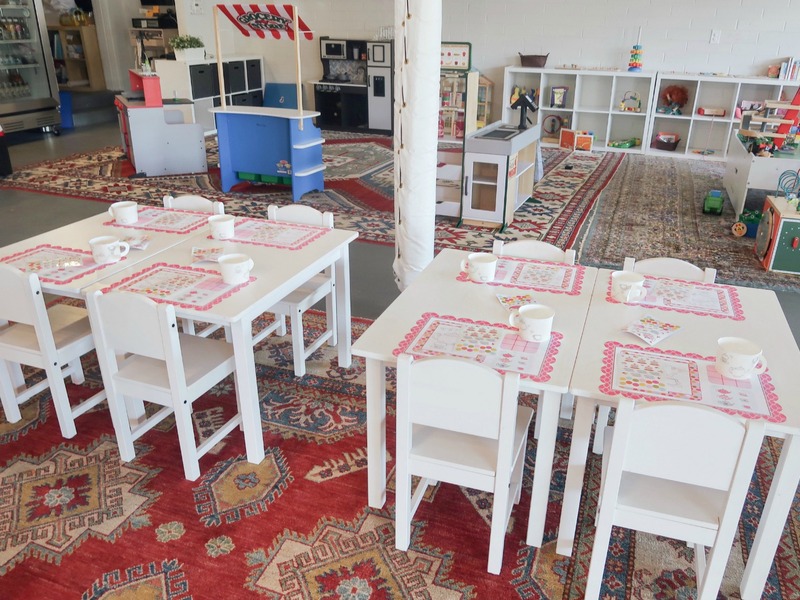 They also have a huge play area with lots of toys for kids. 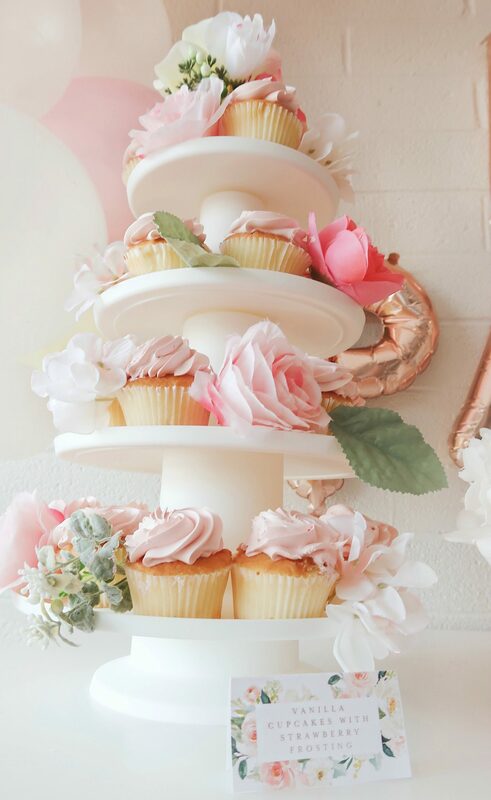 My favorite part of the decorating process was putting together the dessert table. I knew this was where I wanted most of the photos to take place, so I put most of my efforts into it. 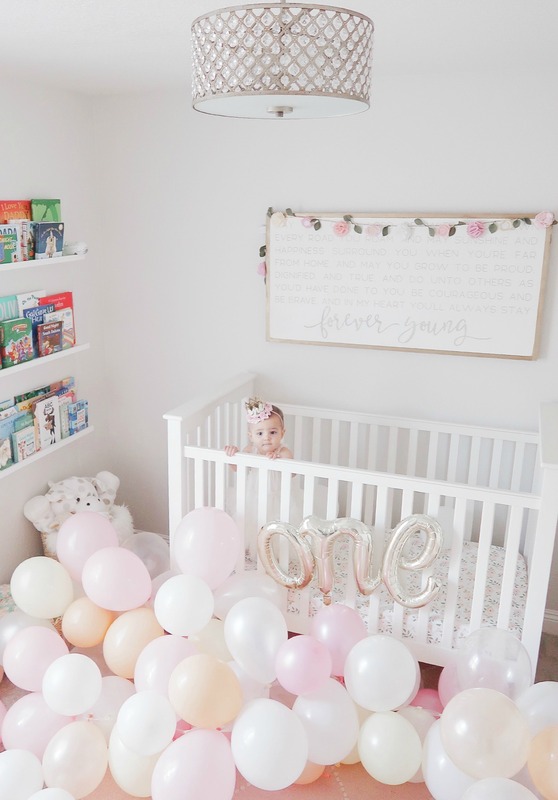 I wanted Scottie’s first birthday to convey the colors and theme of her nursery (see here), so I decorated in neutrals and light pink with lots and lots of flowers! 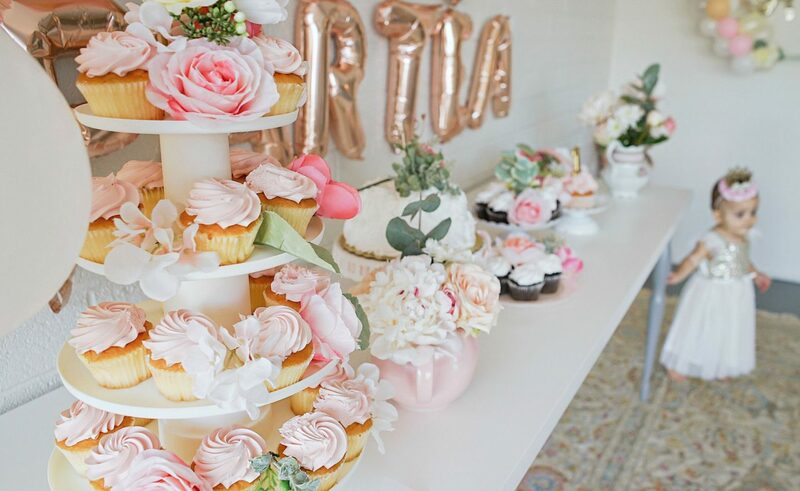 I used fresh flowers for the vases and artificial flowers for the balloon garland, decor, and on the desserts. 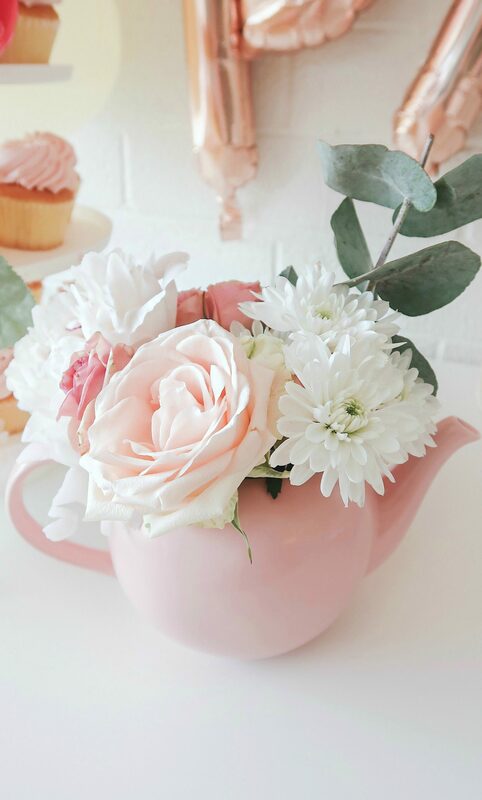 I realized about halfway through the process that the dollar store sells artificial flowers which was so much cheaper than going the craft store route! 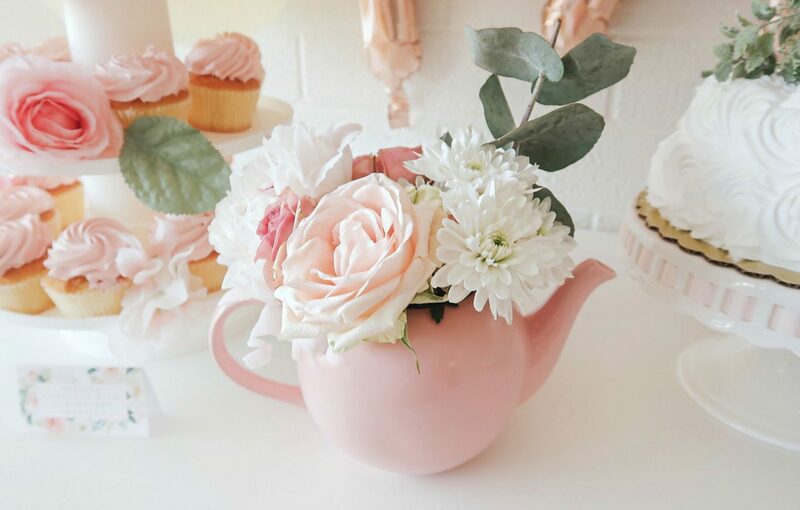 I found the cute pink teapots at Hobby Lobby and the other ceramic vases at Goodwill. I loved how the picture frame with Scottie’s monthly photos (far left) turned out! We actually have it hanging in her room now and it fits in perfectly with all of her decor. I brought my Instax Mini Camera and took photos during the party and hung them on the clothespins in the frame on the far right. 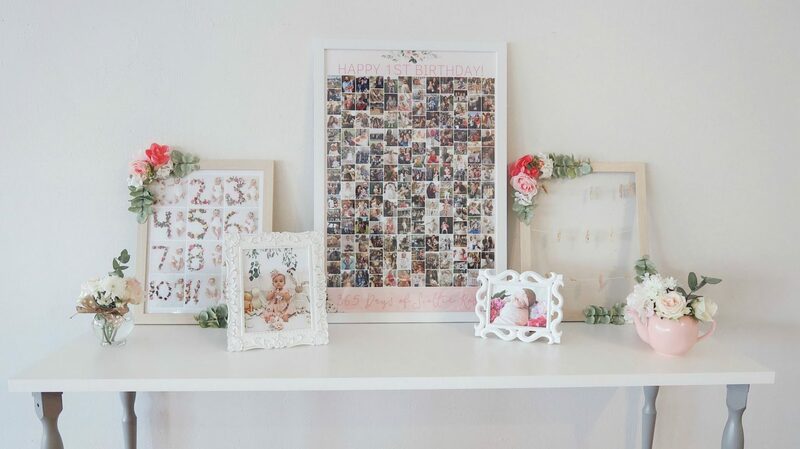 The large middle frame is a collage filled with lots of memorable photos from her first year. The photo second from left is the one I used to make her birthday party invitations. I’ve included a copy of it below! 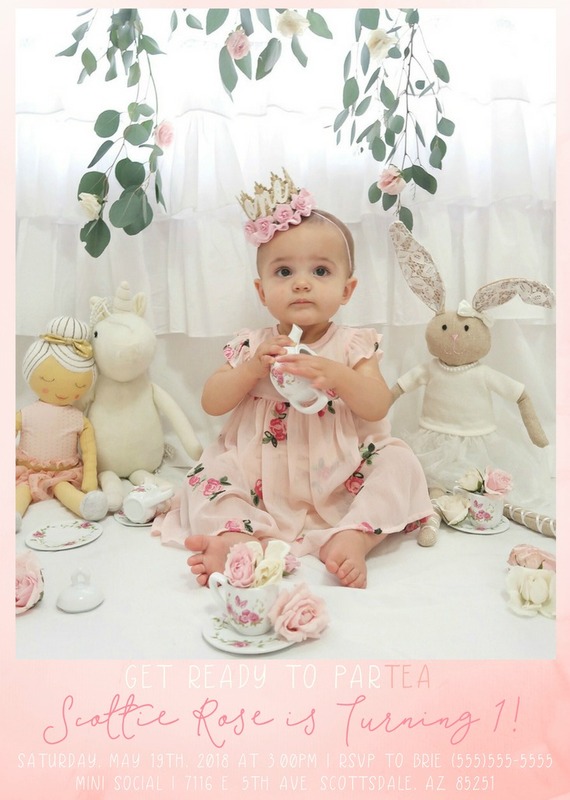 I ordered these tea party theme activity mats and tea party favor cups for the little ones to play with. Scottie was still pretty young for them, but they work great for kids a little older! 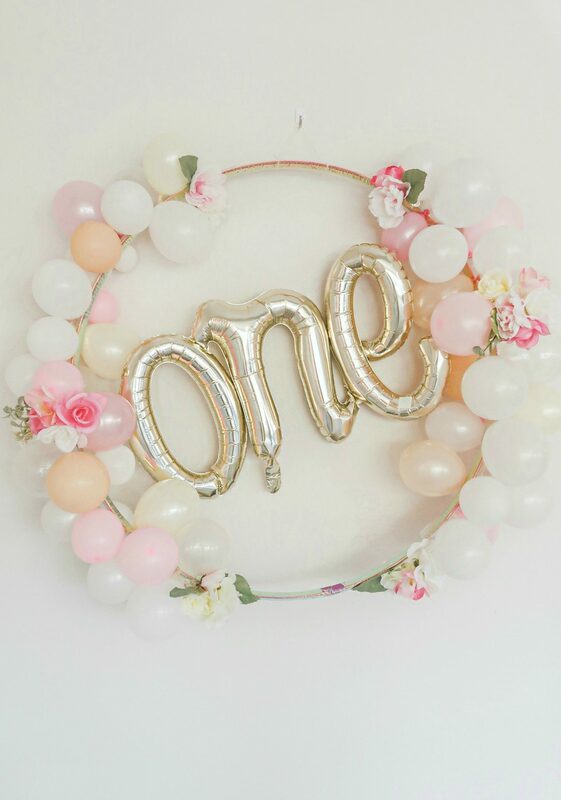 I came across this hula hoop balloon wreath on Pinterest and knew I had to make one for her first birthday party! I love that it doubles as a photo booth when you take the ‘One’ out. 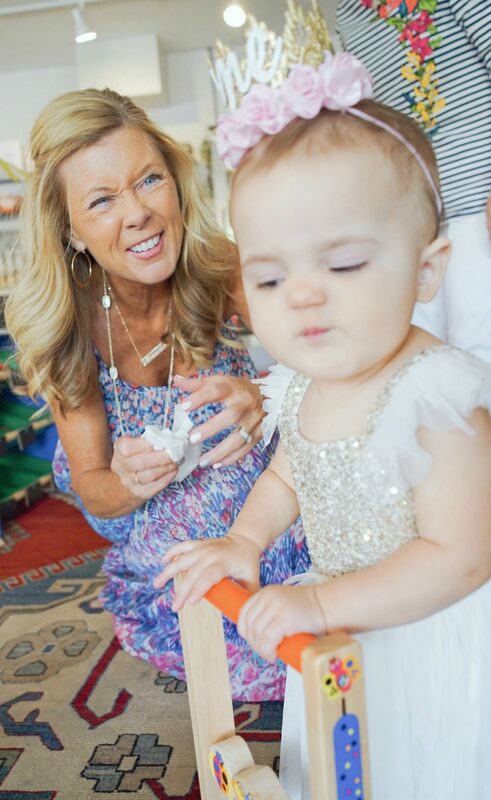 How cute does Scottie look posing in it with her Aunt Makie? Fun Fact: My sister was just 17 days away from giving birth to my niece! And my best friend texted me the morning of Scottie’s party to let me know she couldn’t make it because her water broke! She had her baby girl that same day, nine days before her due date. 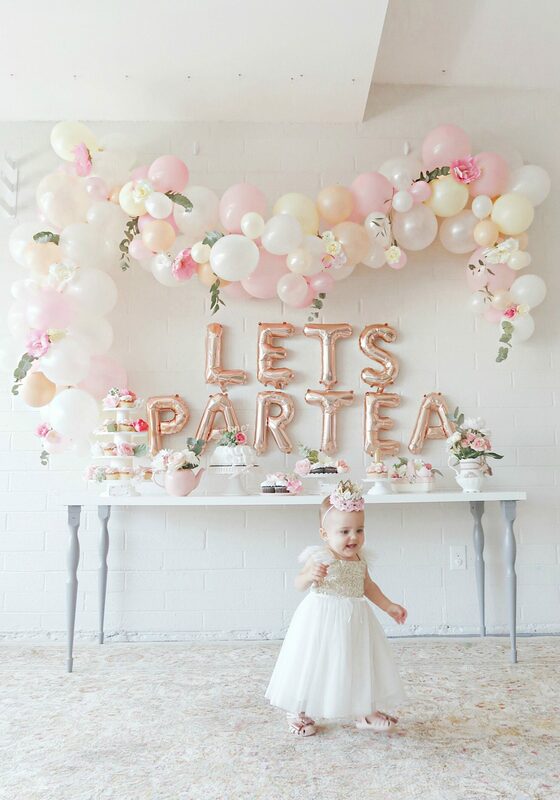 🙂 We’ll be celebrating lots of little girls birthdays next year around this time! 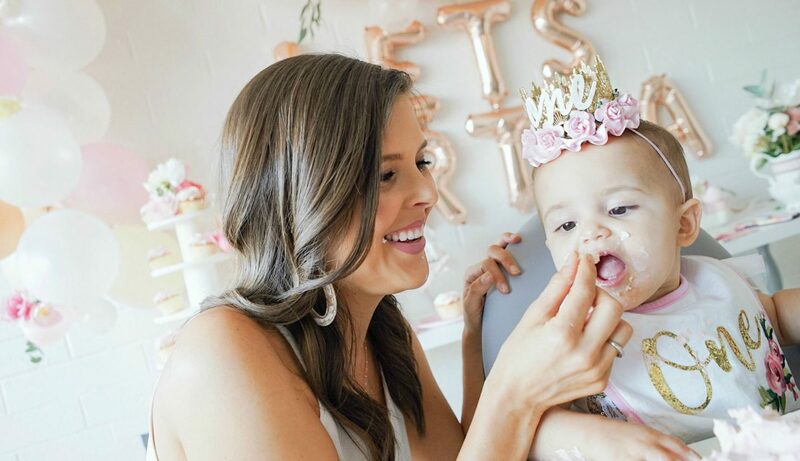 We waited for Scottie’s birthday to give her her first taste of cake, so she needed a little help from Mama to see what she’d been missing out on for the past year! 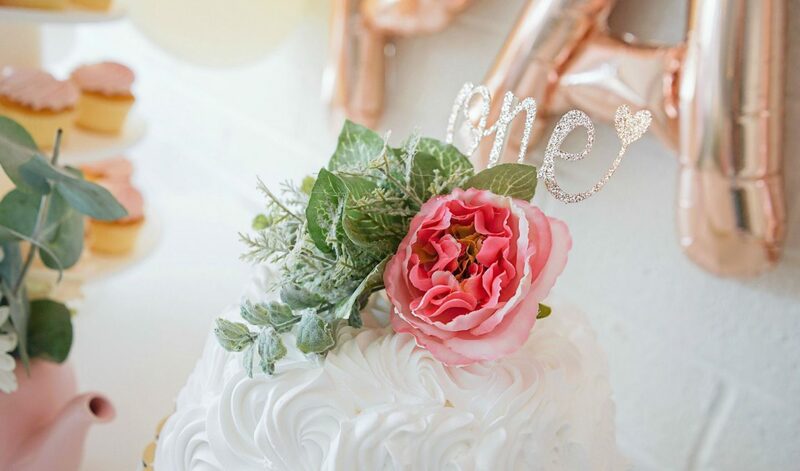 Are you more of a frosting or a cake person? 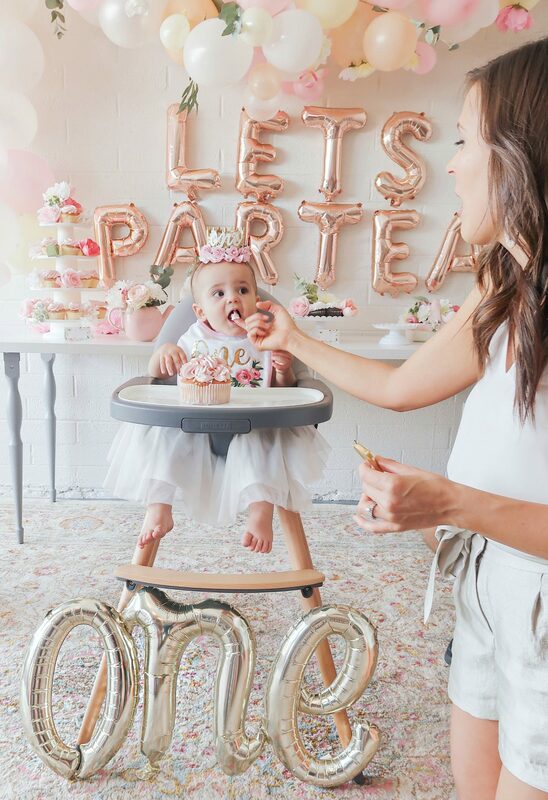 I’m alllll about the frosting, so of course I had to get her started on that! 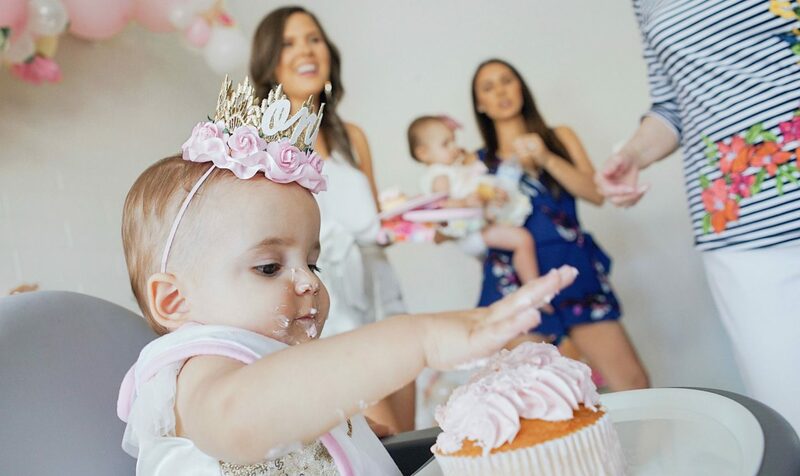 I think it’s safe to say she LOVED the cake! 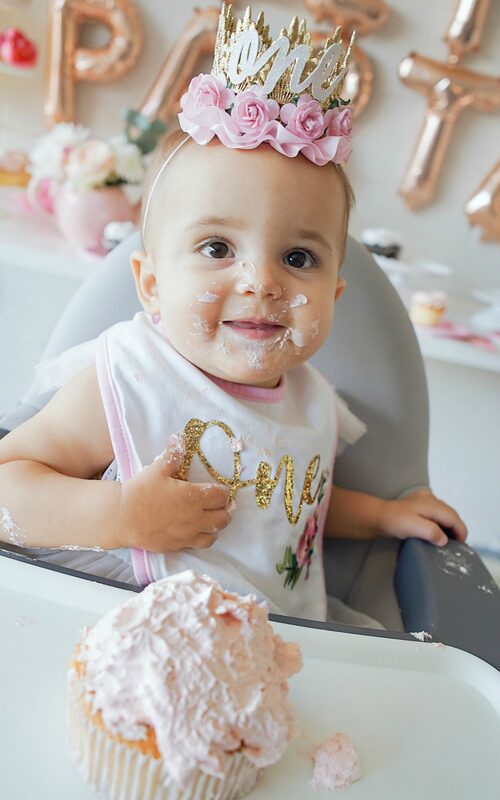 Her bib was another super easy DIY project. I bought it plain at Hobby Lobby and ironed on the ‘One’ patch and floral patch. The floral patch came in a two pack so I also bought a plain white dress and another ‘One’ patch and she wore that the day before on her actual birthday. The bib and the dress cost me around $15 combined to make and was so easy! 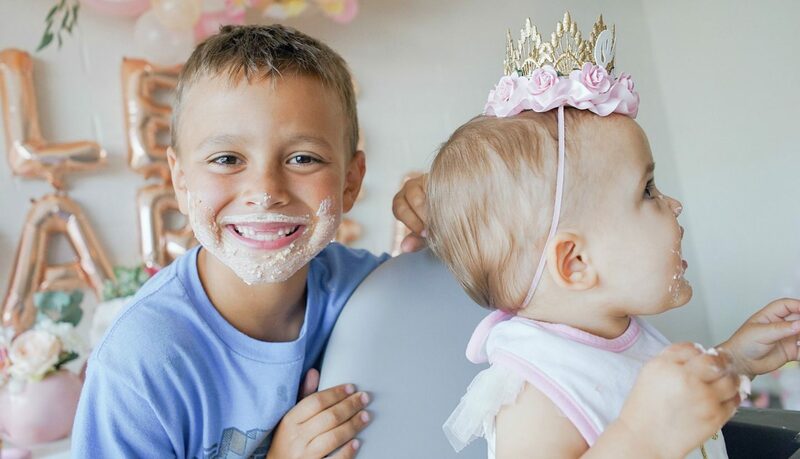 Scottie’s Uncle Mace (my little brother) had a little too much fun eating his cake! 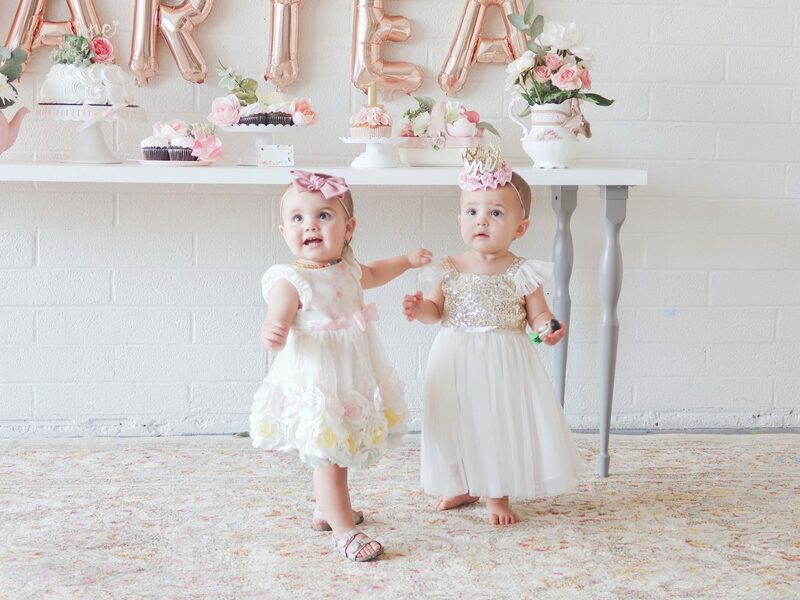 How cute are Scottie and her little bestie Ava? They’re just six days apart and look like they could be sisters! 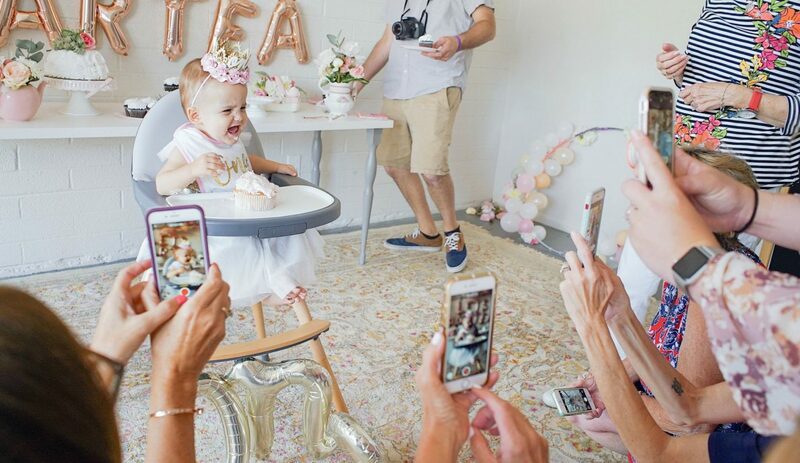 Ava’s mom, Hayley, is the sweetest friend and she has amazing style and shares the cutest mommy and me photos of her and Ava on her Instagram. 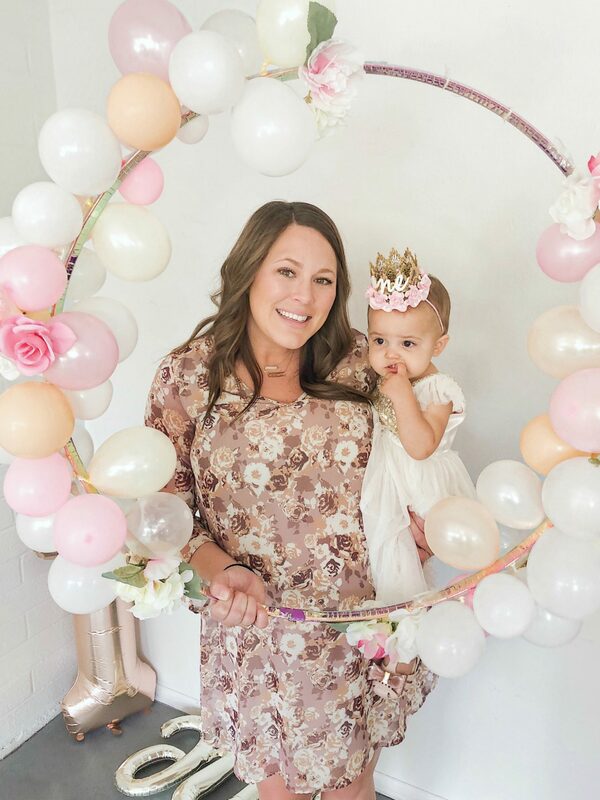 The balloon garland was definitely the focal point of the first birthday party decor and was surprisingly pretty easy to make! I ordered this kit which included everything needed to make it. 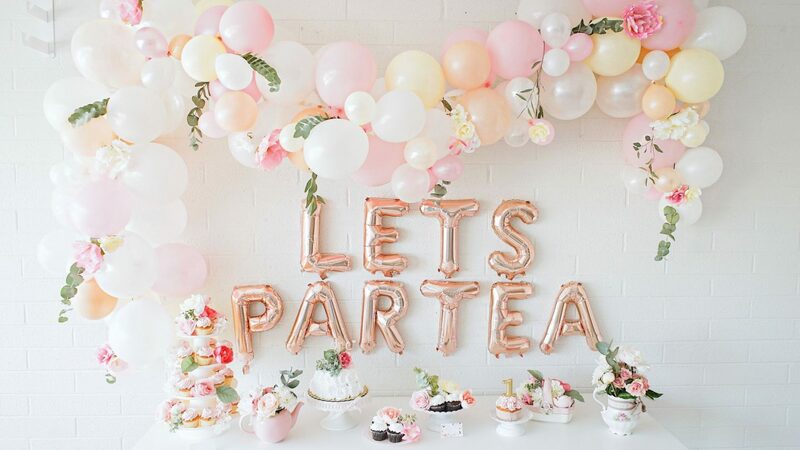 I did buy a few more packs of balloons at the party store to make it a little fuller and added the artificial flowers. We also ordered an extra balloon pump (the kit includes one) so that Colton was able to help me blow up all of the balloons. 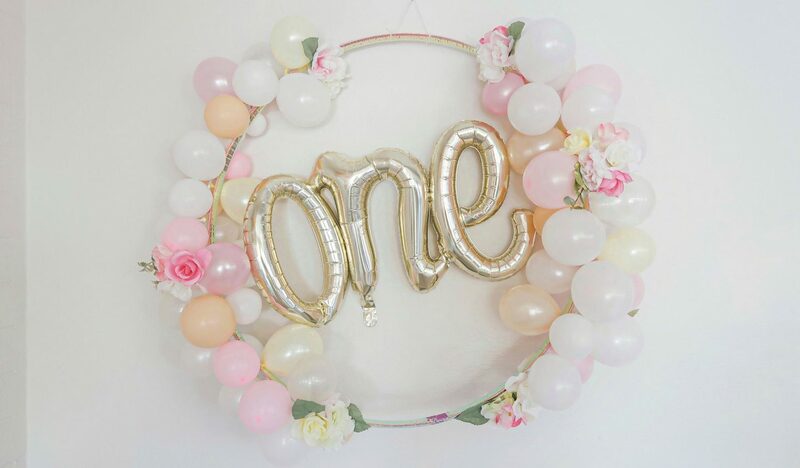 It’s also helpful to have a low temp glue gun to glue clusters of balloons together and to attach the flowers to the balloons. We started blowing up balloons two nights before the party and it probably took us about two hours total. It took me another two hours or so to assemble and hang the garland. 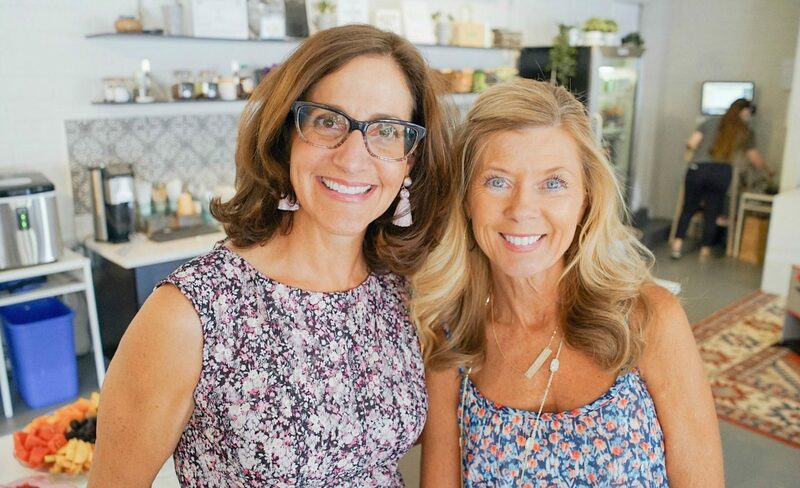 The best “assistants” (AKA Scottie’s grandmas) ever! I truly couldn’t have done this without them! They prepared all of the food and helped out so much before, during, and after the party. Scottie and I love you both so much and are so thankful for all of your help! The party crew celebrating the birthday girl! Thank you all so much for coming to celebrate our sweet Scottie Rose! I also made a little video to remember Scottie’s special day. 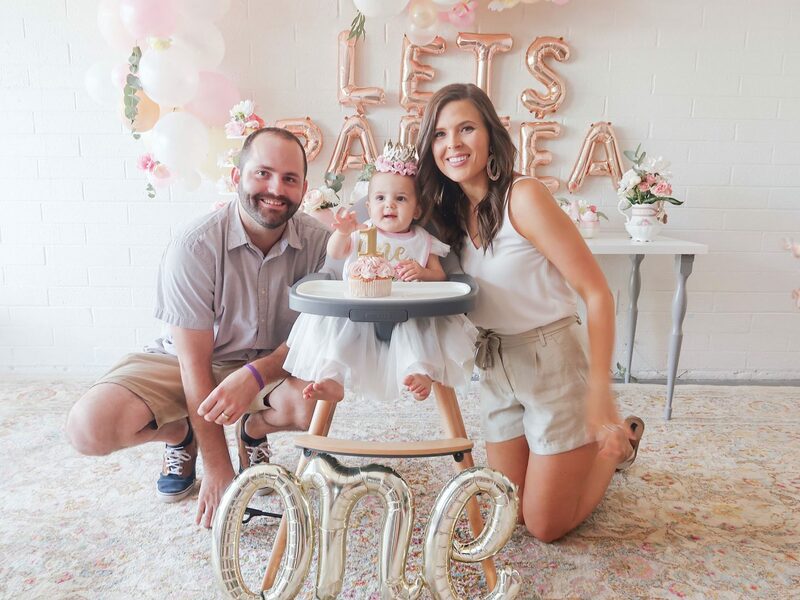 It was such a fun celebration and a day that I’ll never forget! I also linked to all sources below. If I left anything out, please let me know and I’ll do my best to get you the info. 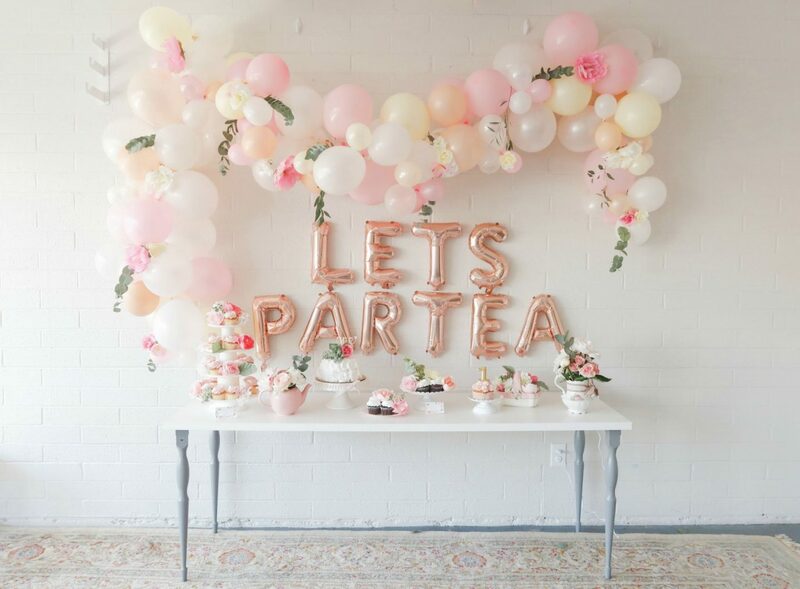 I hope you enjoyed today’s post, I had so much fun prepping for her party and putting this post together. I definitely plan on sharing more content like this in the future if it’s something you’d would like to see more of! 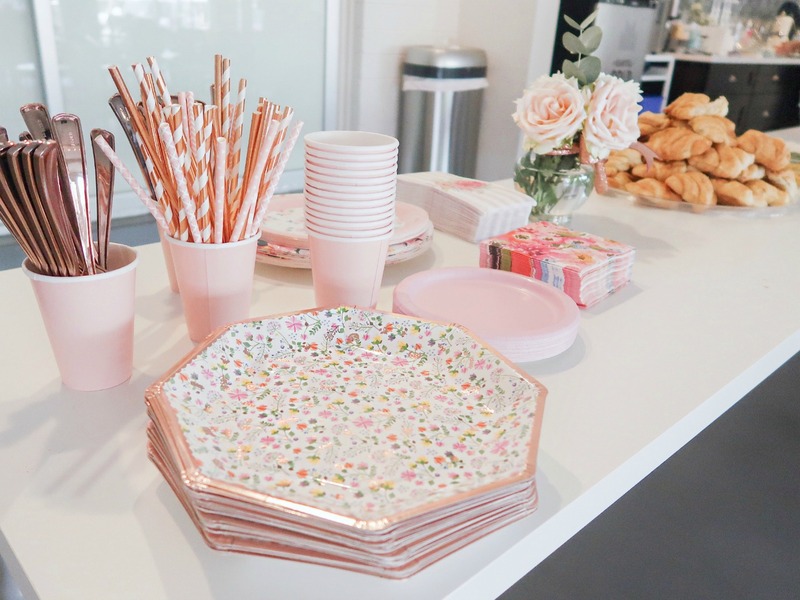 What a darling party! Makes me wish I was having a girl! But I love the high chair. What company is that?? 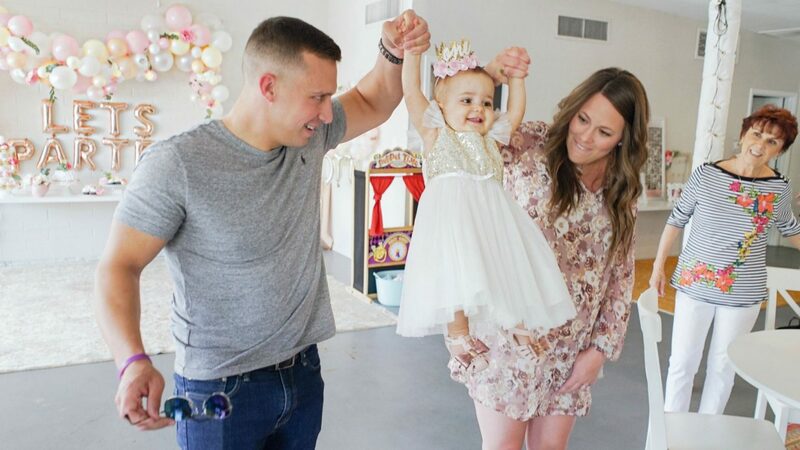 Sounds like Scottie had an awesome first birthday party. Love that you did it at a kid friendly place.